In the process of your personal self-awareness, self-regulating leadership development, you will apply self-constancy - your ability to remain in place and space for as long as it is required of you or to continue straight in pursuit of your goal, looking neither to the left or to the right - on your personal leadership styles to predominantly exercise self-charismatic-leadership to a greater extent than self-transformative-leadership or self-authentic-leadership. It is your active assessment and response ability to your personal situations that dictate which leadership style you should exercise predominantly in relation to your other leadership styles. You are an embodiment of multiple leadership styles that are brought forth by the situations you find yourself in or by your foresight of the coming situations. It is up to you to exercise the requisite leadership style in a situation. In a very simple way self-constancy is like the constant number PI that you use in maths. You can understand the constant number PI in this manner. Before you were born the value of the number PI was the same. When you were in the womb of your mother the value of the number PI was still the same. When you were gladly born and everyone around you was excited the value of the number PI was the same. You are reading this now and the value of the number PI is still the same (PI equals 3.1415926 of just 3.14). If this is clear then take your self-constancy, your ability to remain steady or continue moving at the same pace and submit this self-regulating quality to your self-charismatic-leadership style so that you receive leadership to stay in the constant. To stay in the constant you need staying power. You stay inside your self-constancy by your power of self-charismatic-leadership. 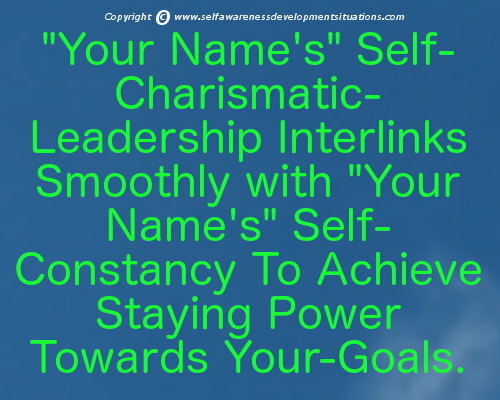 Your self-charismatic-leadership applies the AEBOD acronym (see the video on AEBOD in your course on Self-Leadership By Your Own Precision Words for Beginner's at Udemy to get an explanation of the acronym) to drive self-constancy through your personal qualities creatively selected by your mind provoked by your verbalizations from the PQ Chart (see the video on PQ Chart in the same course to get an explanation of personal qualities chart). With such an interlinking you generate power that provokes, directs and encourages yourself as an intelligent being as you verbalise correctly. So you need to be actively conscious of your personal qualities because your self-charismatic-leadership needs your-personal-quality-consciousness to drive your self-constancy. Make This Your Key Priority! Look forward to Awareness Situation's next newsletter to learn how your Self-Servant-Leadership goes together with your Self-Steadfastness.